Arsenal could reportedly listen to offers for Mesut Ozil in the New Year with the midfielder having fallen out-of-favour under Gunners boss Unai Emery. Ozil has managed just a single start in the Europa League since the last international break and he was most recently excluded from the squad for the League Cup quarter-final due to tactical reasons. Owing to this, there has been speculation regarding his future with the club and The Independent claims that the gossip could materialise into a potential transfer away from the Emirates Stadium. As per the publication, Emery does not consider the German as a regular feature in his first-team plans and he would have no objection towards the midfielder's departure at the turn of the year. 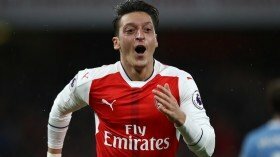 Ozil's £300,000-a-week wages could, however, prove a stumbling block for any suitor but reports indicate that the club may even sanction a temporary deal for the attacker when the transfer window reopens.